Far-right group makes landmark gains in EU parliament after garnering international support. 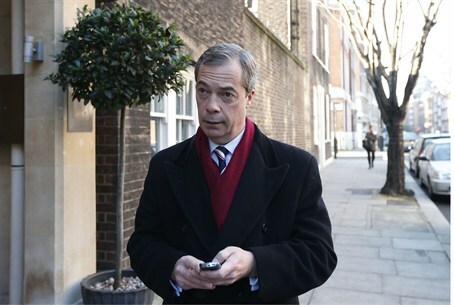 Britain's increasingly popular eurosceptic leader Nigel Farage scored a new victory on Wednesday, putting together a group in the European Parliament after winning the support of a French far-right defector. Marine Le Pen, leader of France's far-right National Front, also is expected to soon announce the formation of a rival eurosceptic group, a source close to the matter told AFP. "I am very proud to have formed this group with other MEPs and we undertake to be the peoples' voice," Farage said in a statement. His UK Independence Party (UKIP) last month tripled its seats in the EU assembly from eight to 24, ahead of both Prime Minister David Cameron's Conservatives and the opposition Labor Party. It needed to muster lawmakers from seven European Union countries to announce the formation of a group. "We will be at the forefront working for the restoration of freedom, national democracy and prosperity across Europe," Farage said. The largest contingent is made up of members from UKIP, followed by 17 from the Italian populist 5 Star Movement led by Beppe Grillo. Other MEPs in the group are from Lithuania, the Czech Republic, Sweden, Latvia, as well as France's Joelle Bergeron, who was elected under the banner of the far-right National Front led by Marine Le Pen but who quickly fell out with the party and became an independent. Le Pen so far had been unable to strike an alliance with parties from six other nations to form her own group. But a source said she was close to rallying the support of MEPs from Poland as well as a Bulgarian, as well as the four other parties she had gathered so far. Forming a group not only provides more political visibility and the possibility of chairing various committees, but also between 20 to 30 million euros in funding during the parliament's five-year term. Le Pen, whose National Front won 23 seats, has the support of around 40 MEPs from the Netherlands, Austria, Italy and Belgium.